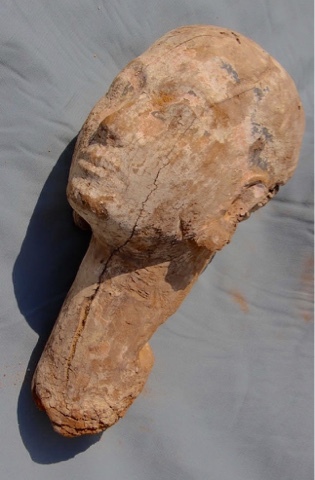 A wooden head, probably of the sixth dynasty queen Ankhnespepy II, has been unearthed in the area located to the east of her Pyramid in Sakkara necropolis during excavation work carried out by a French-Swiss team from Geneva University. Dr. Mostafa Waziry, Secretary-General of the Supreme Council of Antiquities announced today. Dr. Waziry explains that the head is almost human proportions with a small part of the neck which reached 30 cm tall. The ears are decorated with wooden earrings. Professor, Philip Collombert, Head of the French-Swiss mission said that the head was found in a disturbed layer to the east of the queen's pyramid near the area where the pyramidion was uncovered early this week. The mission has uncovered a large upper part of a granite obelisk that may belongs to the queen's funerary temple. 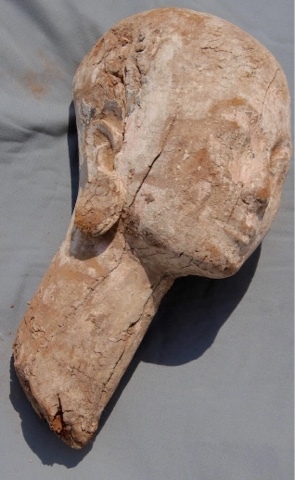 Dr. Collombert said that the head is not in good conservation condition and it will be subjected to restoration. "It is a promising area that could reveal more of its secrets soon," said Dr. Waziri. He added that the mission is to continue its excavations in an attempt to discover the queen's pyramid surroundings and the rest of its funerary complex and collection.